For more information on testing for the presence of alcohol in human saliva (or other liquids), click the above picture. For more information on testing for the presence of alcohol in human breath, click the above picture. Both forms of alcohol testing mentioned above are easy to use and very reliable. In fact, the Alco Screen .02 has been approved for use by the United States Department of Transportation (DOT). Each alcohol test device shown above is a single use test. The Chematics ALCO-ScreenTM saliva alcohol test is intended for use as a rapid, highly sensitive method to detect the presence of alcohol in salvia and to provide a semi-quantitative approximation of blood alcohol concentration. For applications where a quantitative determination of blood alcohol concentration is required, a positive ALCO-SCREENTM result must be varified using an acceptable quantitative alcohol procedure. ALCO-SCREENTM requires nospecial training provided that instructions are followed carefully. However, quantitative followup testing should be preformed by a qualified professional. ALCO-SCREENTM may also be use to non-quantitatively detect the presence of alcohol in many other fluids, such as soft drinks, blood serum, etc. For more detailed information, see our FAQ section below. Retail $9.50. Our price Only $2.79 each. 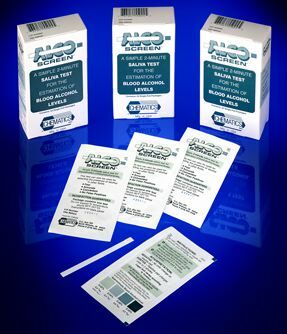 The Chematics ALCO-SCREEN 02TM saliva alcohol test is intended for use as a rapid method to identify the presence of alcohol in salvia for concentrations (BAC) greater than 0.02%. The ALCO-SCREEN 02TM requires no special training provided that instructions are followed carefully. For more detailed information, see our FAQ section below. Retail $9.95. Our price Only $2.99 each. Chematics, Inc. has been the leading manufacturer of saliva alcohol tests since 1988. With over 10 million tests sold worldwide, you can count on Chematics and Alco-Screen as a trusted and reliable partner in your alcohol testing or ZERO TOLERANCE efforts. The Alco-Screen Alcohol Test was designed and patented in 1988 as a simple, cost-effective solution to screen for alcohol concentrations. Since that time, the Alco-Screen has proven to be the leading alcohol screening device in the field. This, coupled with Chematics' trained knowledgeable staff on call to answer your questions, make Alco-Screen the clear choice for your alcohol testing program. Alco-Screen® is a rapid, highly sensitive method to detect the presence of alcohol in saliva and provide an approximation of relative blood alcohol concentration. Since it is well established that the concentration of alcohol in saliva is very close to that in the blood, saliva is the preferred specimen for alcohol testing, allowing for greater detection sensitivity than breath testing methods. Alco-Screen® is a very simple, one-step, 2 minute test requiring no instrumentation, calibration or special training to be used effectively, and is convenient enough to be used any time, any place. Inappropriate consumption of alcohol can be a problem in many family, occupational, institutional and safety sensitive situations. Alco-Screen® provides you with an easy yet effective tool in identifying alcohol consumption. And it is the most cost effective alcohol testing method available. For less than $2.80 per test, Alco-Screen® can help you avoid the risks associated with inappropriate alcohol consumption. Chematics, Inc. has been the leading manufacturer of saliva alcohol tests since 1988. With millions of tests sold worldwide, you can count on Chematics and Alco-Screen® as a trusted and reliable partner in your alcohol testing or ZERO TOLERANCE efforts. Our knowledgeable staff is on call to answer your questions. ALCO-SCREEN™ is a rapid, highly sensitive method to detect the presence of alcohol in saliva and provide an approximation of relative blood alcohol concentration. Alco-Screen is a simple, one-step, 2-min. test requiring no instrumentation, or training. The Chematics ALCO-SCREEN™ saliva alcohol test is intended for use as a rapid, highly sensitive method to detect the presence of alcohol in saliva and to provide a semi-quantitative approximation of blood alcohol concentration. For applications where a quantitative determination of blood alcohol concentration is required, a positive ALCO-SCREEN™ result must be verified using an acceptable quantitative alcohol procedure. ALCO-SCREEN™ requires no special training provided that instructions are followed carefully. However, quantitative follow-up testing should be performed by a qualified professional. ALCO-SCREEN™ may also be used to non-quantitatively detect the presence of alcohol in many other fluids, such as soft drinks, blood serum, etc. (see Limitations for further information). Excessive or inappropriate consumption of alcohol is one of the most common and pervasive social problems in our society. It is a contributory factor to many accidents, injuries and medical conditions. Screening of individuals for alcohol consumption is an important method for the identification of individuals who might be at risk due to alcohol intoxication. Screening also provides additional benefit as a deterrent against inappropriate alcohol consumption. The blood alcohol concentration at which a person becomes impaired is variable dependent upon the individual. Individual specific parameters such as physical size, weight, activity level, eating habits and alcohol tolerance all affect the level of impairment of the individual. The ALCO-SCREEN™ will react with methyl, ethyl, and allyl alcohols. ALCOSCREEN™ will not react with alcohols having 5 or more carbons, nor with glycine, glycerol, or serine. This property is a result of the specificity of the alcohol oxidase enzyme extracted from yeast. The following substances may interfere with the ALCO-SCREEN™ stick when using samples other than saliva: Agents which enhance color development: Peroxides Strong oxidizers Agents which inhibit color development: Reducing Agents: Ascorbic acid Tannic Acid Pyrogallol Mercaptans and tosylates Oxalic acid Uric acid Bilirubin L-dopa L-methyldopa Methampyrone The above-named substances do not normally appear in sufficient quantity in saliva to interfere with the test. However, care must be taken that they are not introduced into the mouth during the 15 minute period preceding the test. Failure to wait 15 minutes after placing food, drink, or other materials in the mouth before running the test can provide erroneous results due to possible contamination of the saliva by interfering substances. ALCO-SCREEN™ is designed and calibrated to be interpreted two minutes after saturation of the reactive pad. Waiting longer than two minutes may result in erroneous results or false positive results. 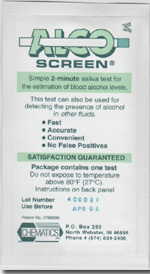 ALCO-SCREEN™ may be used to detect the presence of alcohol in fluids other than saliva. However, when used in this manner, the color chart on the package does not apply. It alcohol is present in the fluid, a color change ranging from a light green-gray to black to cocoa brown will occur as the alcohol concentration increases. Little or no color change may occur with pure alcohol due to the absence of water which is required for the color change reaction. When testing beverages, a . result should not be considered positive unless the pad changes to a very dark brown or black. ALCO-SCREEN™ is highly sensitive to the presence of alcohol. Alcohol vapors in the air are sometimes detected by the ALCO-SCREEN™ . Alcohol vapors are often present in many institutions and homes. Alcohol is a component in many household products such as disinfectants, deodorizers, and glass cleaners. If the presence of alcohol vapors is suspected, the test should be performed in an area known to be free of these vapors (such as outside). ALCO-SCREEN™ is a visually interpreted test where color matching is used to provide an approximation of blood alcohol concentration. As such, exact interpretation of results is not required in most cases. However, persons who are color blind or visually impaired may experience difficulty when a more specific interpretation is required. Test materials that have been exposed to saliva should be treated as potentially infective. These materials should be returned to the original foil package and disposed of properly. 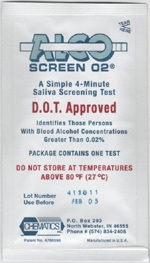 Never use ALCO-SCREEN™ after the expiration date marked on the outside of each test package. 1. Abstain from placing anything in the mouth for fifteen (15) minutes prior to beginning the test. This includes non-alcoholic drinks, tobacco products, coffee, breath mints, food, etc. 2. Open the foil package and remove the test strip. Observe the reactive pad on the end of the test strip. The pad should be a light cream color. A test strip with a reagent pad which is dark tan in color or otherwise discolored must be discarded. 3. Saturate the reactive pad with saliva from mouth or sputum cup. Immediately start timer. 4. At two (2) minutes observe the color change (if any) in the reactive pad. A color change of green or blue indicates the presence of alcohol and a positive result. Results obtained after more than 2 minutes and 30 seconds may be erroneous. 5. Estimate the approximate blood alcohol concentration by comparing the color of the reagent pad with the color chart appearing on the test package. ALCO-SCREEN™ produces a color change in the presence of saliva alcohol ranging from a light green-gray color at 0.02% blood alcohol concentration to a dark blue-gray color near 0.30% blood alcohol concentration. Color blocks are provided within this range to allow an approximation of blood alcohol concentration to be made. ALCO-SCREEN™ may produce colors that appear to be between adjacent color blocks.ALCO-SCREEN™ is very sensitive to the presence of alcohol. A green color that is lighter than the 0.02% color block should be interpreted as being positive to the presence of alcohol in saliva but less than 0.02% blood alcohol. A result where the reagent pad shows no color change (remains white or cream colored) should be interpreted as a negative result (no alcohol present). A result where the outer edges of the reagent pad produces a slight color but the majority of the pad remains colorless should be repeated to ensure complete saturation of the reagent pad with saliva. If the second result is the same, the results should be interpreted as being negative (no alcohol present). ALCO-SCREEN™ should be stored at room temperature, not to exceed 80 degrees F (27 degrees C). Under this condition, ALCO-SCREEN™ will perform according to specification until the expiration date stamped on the package. It storage temperature exceeds 80 degrees F, degradation of the product and performance may occur. If the product is refrigerated, the ALCO-SCREEN™ test must be brought to room temperature prior to opening the package. The integrity of ALCO-SCREEN™ may be qualitatively verified using a test solution prepared by adding 4 drops of 80 proof distilled spirits to 8 oz. (1 glass) of water. This solution should provide a color reaction equal to or higher (darker) than the 0.04% color block. The color reaction with alcohol in saliva is somewhat slower and less intense than with alcohol in aqueous solutions. For additional information regarding controls. please contact Chematics Inc. Other commercially available controls should not be used with ALCO-SCREEN™. Bergmeyer, H.U., Grabl, M & Walter, H. in Methods of Enzymatic Analysis, 3rd ed. Vol. II, ed. by Bergmeyer, H.U., Verlag Chemle, Weinheim, 1983, p. 143. Blanke, R.V. in Fundamentals of Clinical Chemistry, ed. by Tietz, N.W., W.B. Saunders Co., Philadelphia, 1970, p. 1114. McCall, K.E.L., Whiting, B., Moore , M.R. & Goldberg, A., CLIKSCL, 56, 283-286,1979. Jones, A.W., CLIN.EXP.PHARMACOL.PHYSIOL. 6, 53-59,1979. 5. Jones, A.W., CLIN.CHEM, 25, 1394-1398,1979. Negative Result: Blood alcohol less than 0.02%. This simple, highly effective test allows you to tell if the individual being tested is under the influence of alcohol, putting you in control. Inappropriate consumption of alcohol can be a problem in many family, occupational, institutional and safety sensitive situations. Alco-Screen® 02 provides you with an easy yet effective tool in identifying alcohol consumption. And it is the most cost effective alcohol testing method available. 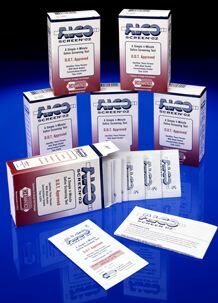 For less than $3.00 per test, Alco-Screen® 02 can help you avoid the risks associated with inappropriate alcohol consumption. Chematics, Inc. has been the leading manufacturer of saliva alcohol tests since 1988. With millions of tests sold worldwide, you can count on Chematics andAlco-Screen® 02 as a trusted, reliable partner in your alcohol testing or ZERO TOLERANCE efforts. Our knowledgeable staff is on call to answer your questions.